See more objects with the color antiquewhite silver dimgrey rosybrown grey or see all the colors for this object. This is a Print. It was designed by Angelo Biasoli and after Francesco Durelli. It is dated 1815–1830 and we acquired it in 1938. Its medium is aquatint engraving. It is a part of the Drawings, Prints, and Graphic Design department. 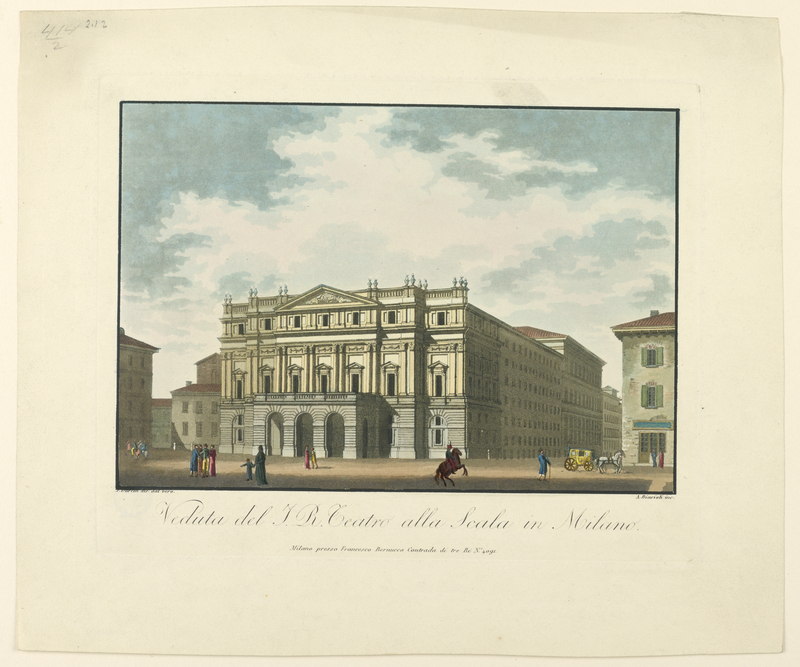 Giuseppe Piermarini (1734–1808) was the architect of the La Scala Theater, which opened in 1778 with a performance of the opera L'Europa riconosciuto by Antonio Salieri. The facade, except for the addition in 1830 of side wings with terraces, presents the same appearance today; it is still a world-famous opera house. This object was bequest of Erskine Hewitt. It is credited Bequest of Erskine Hewitt.